 BOTH HAVE A DEPTH OF 25", A HEIGHT OF 35" AND A SEAT HEIGHT OF 19"
*MADE IN THE USA. USUALLY LEAVES CONNECTICUT FACTORY IN 3 WEEKS. 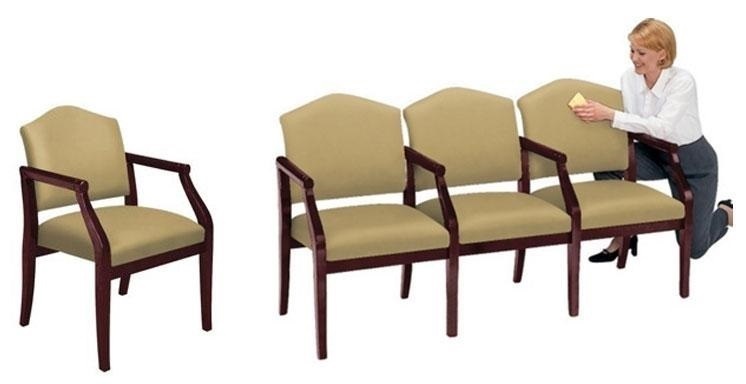 Gorgeous tandem waiting room chairs have a pleasing traditional round arm design & hardwood construction. Choose from 100's of fabric options or Health Care approved vinyl. Mix & match with our new Two Tone upholstery line now available. Your waiting room awaits...order today. Warranty: Lifetime Limited. UPS ABLE, shipping is included.